Yes, autumn is well and truly here. There’s a definitely chill in the air, the leaves are turning color, pumpkins have been placed on doorsteps, and logs are piled high on back porches, ready for the fire. I don’t know about you, but when the temperatures drop, I start to hanker for the heartier foods, none more than the warming soups of central Italy. Some of these rustic soups, especially the Tuscan ones like ribollita, laden with bread and beans and vegetables, have become world famous. Here on this site we’ve also featured some lesser known soups like farinata, made with Tuscan kale, as well as well known pasta and legume combinations like pasta e fagioli, pasta e ceci and pasta e piselli. Today I want to present another soup in this category, one you may not heard of. Zuppa di cicerchia—said to be originally from Umbria but found in Tuscany, Le Marche, northern Lazio and Puglia, too—is made with the Lathyrus sativus, a nearly forgotten ancient pulse which goes by cicherchia in Italian and various names in English, most commonly the unappetizing “chickling vetch” or the ever so slightly more appealing “grass pea”. The technique for making the soup will be familiar to anyone who knows Italian cooking. After soaking the cicerchie overnight and simmering them until tender, you make a flavor base of tomatoes simmered in gently sautéed aromatics, then add the cicerchie soak up the flavors, then add some of the cooking liquid (or broth) and let everything simmer for a good 15 minutes or so, until the flavors have entirely melded. With a few mashed cicherchie to thicken the soup and a drizzle of olive oil to enrich it, dinner is served. Like so much good Italian cooking, it’s utterly simple, and utterly satisfying. Meanwhile, in a heavy saucepan, Dutch oven or terra-cotta pot, gently sauté the garlic and rosemary (and sage leaves if you’re using them) for a minute or two, until the garlic is just golden. Then add the chopped tomato and let it simmer for about 5 minutes, until it has thickened slightly. Remove the garlic and herbs. When the circerchie are tender, drain them and add them to the pot, mixing well. Let them simmer for a few minutes to soak up the flavor of the tomato base. Then add a ladleful or so of the pot liquor, enough to cover, season generously with salt and pepper, and continue simmering for another 10-15 minutes or so, stirring from time to time. Just before serving, taste and adjust for seasoning. If you like a thicker soup—and I do— crush some of the cicerchie against the side of the pot with a wooden spoon. Conversely, add more pot liquor if things get too thick for your taste. Serve hot, drizzled if you like with some best-quality olive oil and some rounds of good crusty bread, toasted or (even better in my book) fried in olive oil. This is a simple recipe, obviously, with finding and simmering the cicerchie really the only tricky bit. 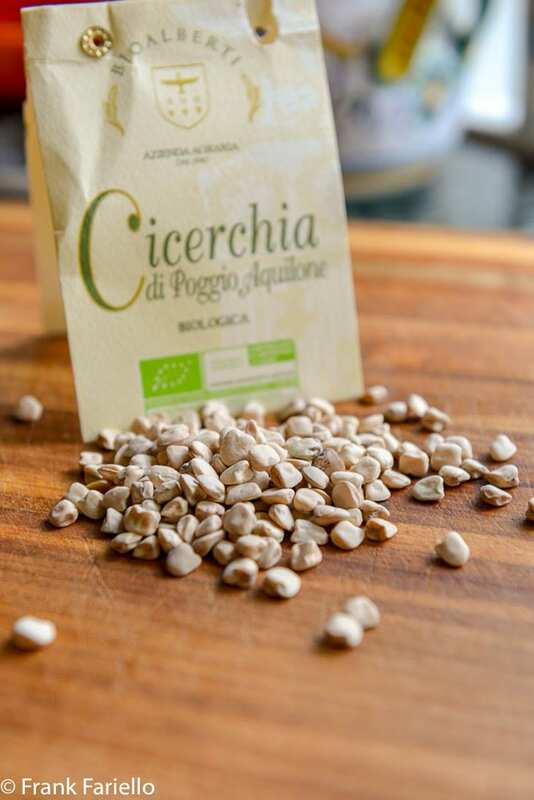 I’ve never seen “grass peas” in any store in my area, but cicerchie imported from Umbria are available online. As mentioned, the cooking time for cicerchie can vary a lot. Traditional recipes tell you to soak them 24 hours, then cook them for two hours. The package of the brand I bought (pictured below)called for an overnight soak and an hour and a half’s simmering. In fact, I got away with just over an hour. If you have one, cicherchie would be a perfect candidate for the pressure cooker. 15-20 minutes at high pressure, followed by a quick release should work well. And if you have a fancy electric pressure cooker like the Instant Pot, or the Breville Fast-Slow Cooker I have at home, use the “bean” setting. Just set it and forget it: the cooker automatically comes up to pressure, cooks, then releases at the press of a button. Magic…! There’s a good deal of variation in the tomato base among recipes. Some use a classic soffritto of onion, carrot and celery instead of (or in addition to) garlic. Some recommend minced garlic and parsley. If you’re a carnivore, you may like the chopped pancetta or guanciale some recipes call for. Many recipes go lighter on the tomato than this one, in some cases rendering the dish practically in bianco although I’ve seen none totally devoid of tomato. Finally, for a starch, some recipes have you add pasta, as if you were making a pasta e ceci. Some add diced potato. In Tuscany they make a soup of cicerchie with farro. The cicerchia is a kind of primitive chickpea, which it vaguely resembles, although it has a rather earthier taste. Said to have originated in prehistoric times in the Balkans, it was quite popular in Italy in the Middle Ages. The hearty, drought-resistant plant was a source of badly needed nutrition in times of famine. After falling out of favor in modern times due to the health risks—excess consumption can lead to lathyrism—the cicerchia has recently seen a revival in interest, most commonly for soups like this one or paired with pasta. In Abruzzo, they ground dried cicherchie to make a kind of polenta called fracchiata. Italy is not the only country that enjoys this unusual pulse. It is eaten in Spain, where grass pea flour is used to make a kind of savory porridge called gachas manchegas. The grass pea is particularly popular in south west Asia and the eastern Horn of Africa, where it is cultivated for both human and livestock consumption. In Ethiopia and Eritrea, grass peas are eaten boiled or the flour used to make a flatbread bread known as ‘kitta’. And in India they are made into a kind of dahl or the flour used to make roti. In a heavy saucepan, Dutch oven or terra-cotta pot, gently sauté the garlic and rosemary (and sage leaves if you're using them) for a minute or two, until the garlic is just golden. Add the chopped tomato and let it simmer for about 5 minutes, until it has thickened slightly. Remove the garlic and herbs. Drain the cooked circerhie and add it to the pot, mixing well. Let the cicerchie simmer for a few minutes to soak up the flavor of the tomato base. Add a ladleful or so of the pot liquor, enough to cover, season generously with salt and pepper, and continue simmering for another 10-15 minutes or so, stirring from time to time. Taste and adjust for seasoning. If you like a thicker soup, crush some of the cicerchie against the side of the pot with a wooden spoon. Conversely, add more pot liquor if things get too thick for your taste. Wow Frank! What a recipe! You used one of the most ancient legumes in the region! We call this Lathouri these days, but it was knows as Lathyros in ancient Greece. It’s nowadays used to feed livestock, but it’s making a small comeback in the some kitchens, mostly by foodies and people who rediscover old ingredients. We never seen those sold in a store, but we’re sure we can get some online, like you mentioned. 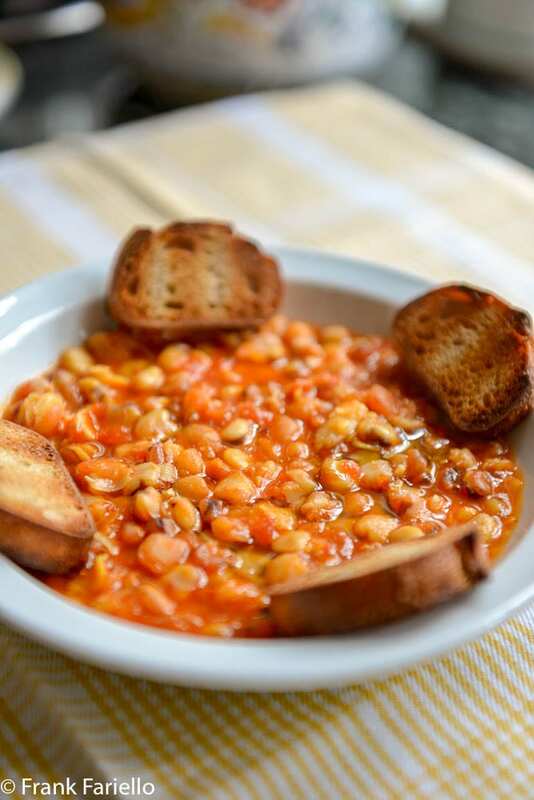 Your recipe is amazing, it’s 100% the way we eat legumes here, thick and rich with crusty bread. We bet some smoked herring or olives will we amazing with this dish. Thanx so much for posting this awesome recipe Frank! Edit (so sorry): We are totally wrong, looking further into this, Lathouri is a different legume than the one we thought. We were talking about Loupino (Lupinus). Huge mistake. Lathouri is actually widely known as Fava here and it’s a staple in the Aegean islands. Santorini Fava is the most cherished one, and is considered to be the most tasty. It’s sold without the skin and if you can get some (it’s a bit expensive, because there’s limited production, plus it’s PDO) you will indeed notice a difference. We can’t wait to cook this, thank you, and we apologize for rumbling on, on your comments section. OK, rub it in… Actually I’m one of those perverse people who enjoy seasons, including the cold ones. Good excuse for eating these hearty foods! Ah la jota, l’adoro! Se ricordi, qualche anno fa ho scritto un post con la ricetta. I must try cicerchie again: one of the few things, I cooked and chucked away, a couple of times! – they seemed never to fully cook properly. Do they become as tender as properly cooked chickpeas? Well, this batch at least cooked perfectly tender, and in less time than most recipes call for. I suppose each batch can be different? And on the northern Italian soups, I certainly agree, and you’ll find a few here on the site, including—speaking of Austro-Hungarian influences—la jota triestina. Yes, well I thank you for not calling it “chickling vetch.” And after following your link, I guess I hope I don’t love this soup too much! I wonder how much you’d have to eat to eat too much? Regardless, I can’t wait to dive into a bowl. Thanks, Domenica! That’s a perfect way to describe their taste, it seems to me. Interesting! I’ve never heard of Zuppa di cicerchia, and in fact I’ve never heard of grass peas, either. But this sounds like a super comforting recipe that’s perfect for these chilly days. I couldn’t agree with you more about the rustic simplicity of Italian food…it’s one of my favorites! I love making soup during the winter, and I’m adding grass peas to my Amazon wish list for the next time I make an order. Thanks for sharing this fun one, Frank! You’re welcome, David! And do let us know what you think if you wind up trying these guys. I love chickpeas and would love to get my hands on cicerchia beans. I always learn something new when reading your blog. Thanks so much, Gerlinde. Too kind! Frank – I’m familiar with Cicerchia but only in the last few years, after seeing so many heritage grains return to favor. I must admit though, I’ve never tried them, and wouldn’t know where to get Cicerchia here in the states. Where did you find yours? I got them from amazon.com. And Gustiamo also carries them. I’ve never seen them in any stores! Perhaps in New York… ? Hi Frank. I just discovered your site and have enjoyed checking out your delicious looking recipes. This one sound great! I especially like this type of dish this time of year (even though I live in LA, where it’s mostly warm 😉 ). I’m loving the flavors here and think I’m going to try this one soon. Thanks, Valentina, and welcome! Always delighted to hear from a new reader and fellow food blogger. I’ll be checking out your site very soon. What a lovely soup to warm us on these decidedly cold days. I’ve not heard of this unusual legumes but it sounds delicious. Will do my best to find ( order ) cicerhie . Appreciate the lesson. Thank you Frank ! I think you’ll enjoy them if you do. Frank, you have introduced me to a variety of bean I was unfamiliar, very much appreciate the link and will order some very soon. Just the type of soup we look forward to as the weather changes. Thanks, Paula! Definitely worth a try. I’ve never run into cicerchie, either here or in Umbria (like many Italianists, I studied there, at Stranieri and at the regular university). I’ve never seen them, though I live five minutes’ walk from a famous Italian grocery, Fruiterie Milano. They look a bit like corn kernels. Do you find the Instant Pot worth the counter space? They aren’t at all expensive, and often on sale here in Canada as they are a famous Ottawa invention by Chinese-Canadian computer whizzes. But my urban kitchen is not very big, and as in many 100-year-old places, short on storage. The cicerchia is quite an elusive product, even in Italy, only quite recently coming back into vogue. I had never seen or heard of it myself back when I was living there, either! I can’t comment on the Instant Pot, really, since I have the Breville. Hard to say if it’s worth the counter space. I am fortunate to have a fairly large kitchen, so it’s not really an issue. I guess it depends just how much space you can spare. But I can say that I use it very often, almost daily, especially in the colder months, for broths, soups, stews, risotto (yes, I “cheat” and make risotto in a pressure cooker) and just last night, polenta. All of which you can do in a countertop pressure cooker as well, of course, but the “set and forget” aspects makes it so simple to use, and takes most of the guesswork. That makes me inclined to get one. There is even a tiny one, usually under $100 CDN, but I suspect that is more for foreign students (many of them East or South Asian) living in dorms at the university where the Instant Pot inventors taught and worked (confess I love the story; it is so revenge of the nerds). Very interested in the polenta application! Very interesting post Frank and a very hearty soup. I must admit, I had to google cicerhie to learn more about it. It looks a bit like a Lima bean, but I’m sure it has a different taste. Don’t know if they have them at my Italian grocer, but I’ll be checking. Indeed does look hearty and I love soups. It does have a “beany” taste but yes, different. Closer to a chickpea, perhaps, if a bit more ‘rustic’ I might say. Hard to describe in words. Unfortunately, it is an elusive food stuff, even in Italy it is not common. You can ask your grocer, perhaps about finding it if s/he doesn’t carry it. Here in the States, online is your best bet, I imagine the same in Sweden? Oh my! Zuppa di cicerchie! This is one of my favorites, and what lovely wwwork you have done, amico. I hope all is well with you, and I wish you and yours the warmest of holidays. Lovely to hear from you, Adri! Trust you’re doing well, it’s been quite a while. Delighted to hear you know about this soup—it seems that very few people have! And happy holidays to you and yours, too!